Community members are remembering the massive landslide of Aug. 9, 1968, that changed the face of Fort Smith forever. 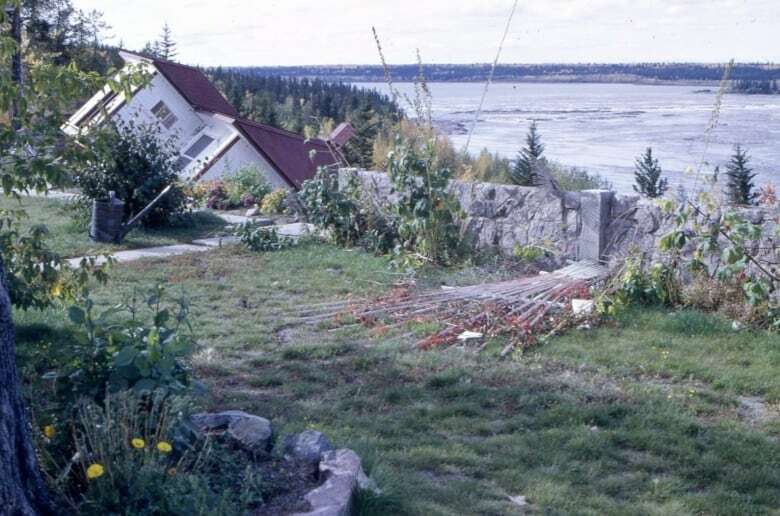 Fifty years ago Thursday, a historic landslide in Fort Smith, N.W.T., changed the face of the town forever. Now, community members are gathering to commemorate the anniversary of the landslide, which killed one resident and permanently changed life in Fort Smith. The landslide forced dozens of families to abandon their homes and disrupted their traditional lifestyle along the Slave River, in a community known as the Indian Village. "I believe that every survivor of the landslide, that evening of Aug. 9, was traumatized," said Jeannie Marie-Jewell, one of the organizers of the event. She says commemorating what happened is one step toward healing the community. 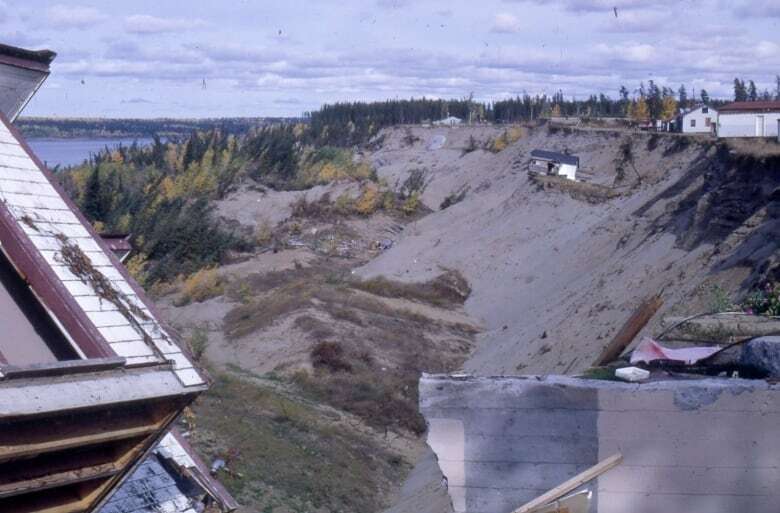 On Aug. 9, 1968, a landslide more than 1,000 metres wide and 300 metres deep hit the town with no warning. Shifting sand pulled entire homes down a steep riverbank. 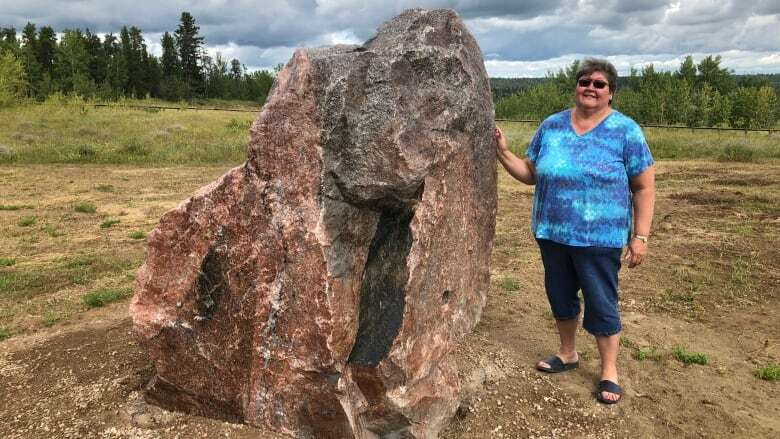 Kay Ferguson, 54, was killed when she was buried under tonnes of loose sand. "I could see this house disappeared, and it was the Ferguson's house with Mrs. Ferguson in it," said Shannon Coleman, a longtime local resident and landslide survivor. Hundreds of local volunteers and national emergency and mine rescue teams took part in the effort to find Ferguson. They were not able to free her body for more than three days. Ferguson is being commemorated with a new bench near the site of the landslide, while a ceremonial plaque will list the names of all the families affected. The unveiling of the new memorial will begin at 4 p.m. Thursday, followed by a public fish fry and drum dance. Family members will also share their photos and memories of the event. "It's a great opportunity for the community of Fort Smith ... to come and understand [our] history," said Marie-Jewell. It's also a chance to "pay respect to the people who survived the landslide but have passed on, [and] ... to the family of the Ferguson's who lost their mother during the tragedy," she said. Stories and photos from the event will be shared on a community Facebook page, "50 Year Commemoration of the Fort Smith Landslide." CBC News will be publishing an interactive feature diving into the impact and legacy of the Fort Smith landslide. Stay tuned to our CBC North Facebook page and to CBC.ca/North for more from Fort Smith. Multiple landslides take out a log house, uproot trees near Reindeer Station, N.W.T.